A refuge of light and glass, luxurious ambience, brightness and openness in the protection of the mountain, nature and space combined in architectural terms: this is the Oyster Villa - an object of superlatives in a spectacular panoramic location on Lake Constance.Impressive feature is the oyster-inspired shape with a fully glazed southwest side over three floors. 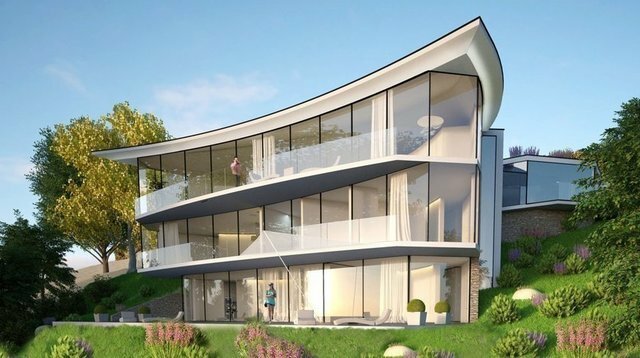 The lake-facing building opens with its glass front to a fantastic, unobstructed 180-degree panorama; with a direct view of Lake Constance, the flower island of Mainau and the Alps. Furnished with the finest materials, it combines the advantages of an exclusive location with extravagant style: a villa that leaves nothing to be desired.Highest safety standard due to coded access and alarm secured camera surveillance. The exceptional entrée can be reached either by car via the car-lift called by radio or via a passenger lift. From the underground car park you also have a view of the lake. The building with underground parking is manufactured in massive construction. Energetically, the Oyster Villa is a low energy house. Underfloor heating and cooling ceilings provide optimal year-round climate. External sunscreen prevents unwanted solar radiation. High-end sliding windows with the minimal frame, as well as a glass balustrade of the balcony allow an unfiltered view over the lake. Sunrises and sunsets in interaction with the Alps, the lake and the beautiful landscape, are a special event every day and are due to weather-related lighting effects to the individual natural spectacle.The equipment is at the highest level, with exclusive natural stone and parquet flooring, bathrooms with high-quality sanitary items, floor-to-ceiling doors, sophisticated lighting system from the most modern high-end manufacturers, high-end standard with networking via KNX cable and intelligent control of electrical equipment. The cooking area of the Oyster Villa meets the highest standards of aesthetics and exclusive cuisine. It is a composition of the finest materials and state-of-the-art equipment, in a perfectly coordinated design and in harmony with the Oyster Villa architecture.n front of the spectacular glass facade lies one of the most beautiful lakes in Europe. The interior of the house reveals a luxurious living and lifestyle ensemble. Upon request, a unique design concept with exclusive spa area, with jacuzzi, as well as a separate fitness area with a horizontal shower and a sauna with lake view can be implemented. A master bedroom and further luxury en-suite bedrooms invite you to enjoy the view and let your eyes wander. Between heaven and sea you will find relaxation in perfect form - no matter whether you enjoy your bath, look over the lake or just want to unwind. The living space on the 3 floors in the resulting villa can still be divided individually in certain areas if the purchase decision is made in good time in consultation with the architect.